These videos showcase the Factory Presets and the capabilities of the 88 Series Piano engine. Please watch in HD, otherwise the sound quality will be deeply compromised. All piano sounds featured in these demos come from O.D.D. Grand Pianos and the only processing applied is a bit of external reverb (Logic's stock reverb) and a limiter on the output (Pro-L2). Already having four pianos in our product line, two of which are very sought-after top-notch models, made the choice for a new piano difficult at first, but very rewarding in the end in our humble opinion. What we find sometimes, in sampled pianos, is a lack of personality as to try to fulfil the dream of the perfect piano. As any accomplished piano player knows, though, such a piano might only exist for a single player, not for the world-wide community of piano players. So, among other ventures we are developing, we decided to do an odd, peculiar piano. We deliberately chose to sample the piano with full detail (11 dynamic levels) but stop before the "ff" dynamic, to have a piano with a warm and intimate sound. We chose a very good sounding Yamaha C6. We chose and carefully placed no less than 29 microphones around the piano in order to achieve many different sound signatures. We chose one of the best studios in Italy, Art&Music Studios. We chose microphones which do not represent common choices for recording "perfect pianos", but mics we found were complementing the sound we had in our minds and hearts. We compiled and edited the whole thing as a set of 3 soulful and colorful instruments. 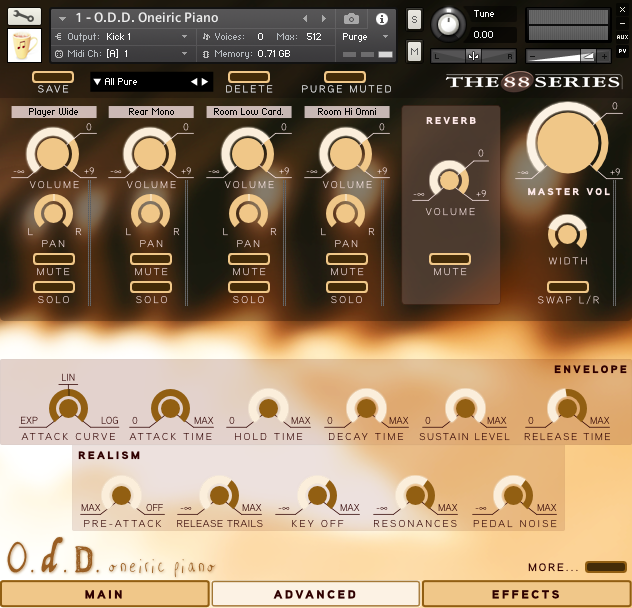 O.D.D Gran Piano is made up of 3 Kontakt NKI Instrument files. An open, wide piano sound, with lots of roomy combinations. A ribbon-mic based combination, bringing a lot of personality and some precious darkness with an edge. Based on dynamic mics and the odd end of the piano (its bottom side) creates an edgy and wide sound palette. 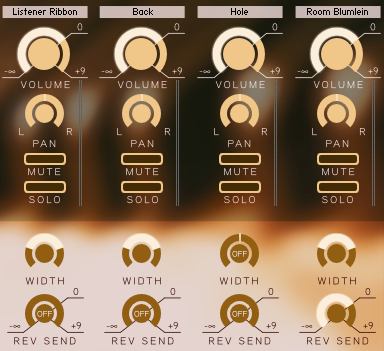 One might think that having 3 NKI Instruments, each featuring four different choices and combinations of mics plus the reverb would make finding the perfect balance impossible. Just by dialing different settings on these 3 knobs it's easy to change the piano and adapt its response, sound and tone to better fit the composition and/or your playing style. Our approach to sampled Instruments is to let the musician in you fly free of any technical burden. Fast, full satisfaction is guaranteed: you just need to play, the fastest possible learning-curve is always kept as a reference when designing our Instruments. At the same time, when there's that techie-need to tweak and fine-tune, our multi-layer user interfaces allow for it, giving you the best of both worlds. We believe the real break-through in these ages is creating advanced, high-quality Instruments which don't require you to earn a master in computer programming before you start making music with them. Making matters easy for the musician always means introducing more and more layers of complication for us developers. First of all we are musicians, and we don't want you to end up putting our products on a virtual shelf and forget about them because they are too hard to learn and use. Our effects section doesn't require a degree in audio-engineering to make the best out of it. Just select one of the 71 main Presets and fine tune it using a few carefully selected parameters. The Compressor & Tape Emulation section, usually hard to grasp for the inexpert in audio tweaking feature no less than 22 + 22 (for when using a single Mic only, marked with a + sign) presets with a simple Amount knob to rule it to your taste. The Reverb section, so critical for acoustic pianos in particular, features an 100% in-house developed collection of 101 carefully selected high quality Impulse Responses coming from both real spaces and revered vintage and contemporary studio hardware. Added with Version 1.5, MIDI key-based level trimming allows you to further customize the dynamic response of the piano based on your keyboard action, taste and listening environment.